For information about the Rite of Christian Burial please click here. Catholic cemeteries were established to carry out the sacred religious function of the burial and care for the resting places of beloved deceased. There is a deep religious significance of the Corporal Work of Mercy involved in the burial of the dead and reverence of the deceased. We are committed to the respectful care of the people of God who even in death remain a part of the whole Catholic community. We are committed to encouraging Catholic prayer and devotion for our deceased brothers and sisters especially those who have been laid to rest in our parish cemetery. A cemetery is sign of faith in the Resurrection and a place of hope of the new and eternal life promised by Jesus Christ to his disciples. May they all rest in peace. You are also invited to visit the Diocese of Providence’s Catholic Cemeteries website for more information. For information about our parish cemetery, please contact the rectory. Please contact the parish rectory office if you wish to purchase a cemetery lot at St. James Cemetery, Old River Road, Manville; or if you have any questions relating to the cemetery. St. James Catholic Cemetery has as its primary goal in providing a dignified burial place for the faithful departed. We offer services in harmony with the teaching of the Church, and show a degree of care that reflects the spiritual values inherent in the tradition of the Catholic burial. The guidelines are designed for the express purpose of governing the activities in St. James Parish Catholic Cemetery for the mutual protection and benefit of lot holders and the cemetery as a whole. They are established with certain restrictions to ensure uniformity and control within the cemetery grounds. These guidelines are not intended to be restraining, or all inclusive, but rather to define an orderly plan of operation, care and permanent maintenance. A complete set of the rules and regulations are kept on file at the cemetery office and are available for your inspection during regular business hours. With this understanding in mind, the lot holder is requested to honor the following provisions. 1. The purchaser of a plot in St. James Catholic Cemetery does not acquire the property itself, but only the “right of burial”. 2. No interment will be permitted in the cemetery, or rights acquired by the purchaser, until such time that full payment has been received for the plot. 3. The interment fee is separate and distinct from the purchase of the “Right of Burial”. This fee must be paid in full prior to the interment. 4. Grave spaces may be used for the burial of human remains only. Normally, a maximum of one interment or two inurnments (cremated remains) is permitted in a single grave. If space permits, a family may purchase an additional “Right of Burial” for cremated remains to be placed in a single grave where one interment has taken place. 5. Since St. James Catholic Cemetery is a Catholic Institution, it is customary that interments are provided for Catholics. As a sign of the bonds of family unity, non-Catholics may be buried in a Catholic cemetery alongside the Catholic members of the family. 6. Assignment or transfer of any plot will at all times be subject to the guidelines of St. James Catholic Cemetery. No burial space or interest therein will be transferred or assigned without the consent of the Pastor/Administrator. A notarized statement indicating permission of the original purchaser and/or his/her heir(s) is required. A recording fee may be charged to provide this service. 1. 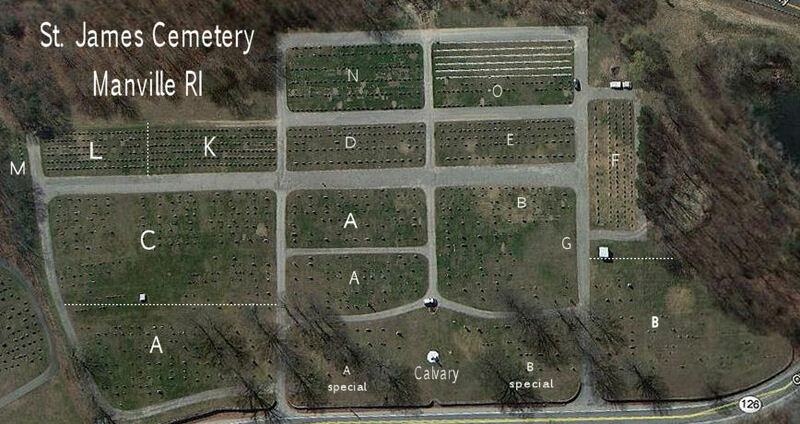 No sections in the cemetery may have in ground planting privileges. Please check with the cemetery office for more information. 2. Due to the possible hazards they may cause to employees and visitors, the placing of chairs, benches, toys, plastic or metal designs, ornaments, pictures, shells, chips, gravel, settees, trellises, and similar articles will not be permitted. 3. American flags may be placed on Veterans graves. 1. Graves must be paid in full before a marker or monument may be placed. 2. The size, style and numbers of memorials will be governed according to the section of the Cemetery in which they are to be placed. Information on grave stones should be faxed from the Memorial Company and approved by cemetery office. 3. In keeping with Christian ideals, a Christian character or emblem should be the main feature on all memorials. Prayers and Epitaphs of a positive nature, may be permitted with Cemetery approval, and must be of limited wording. 1. The grave to be returned is not marked with a family memorial or individual memorial. 2. Any existing memorialization must be removed at the families expense. 3. Proper notarized statements to show proof of ownership must be submitted to the Cemetery Office. 4. If a grave is returned a refund for the original price of the grave will be given. The following information is provided to assist in the preparation of the Mass of Christian Burial at St. James. You are also invited to visit the Diocese of Providence’s Catholic Cemeteries website: http://www.blessedgrounds.com/ for more information.